Only one needle made it to Las Vegas. I’m pretty sure they probably came out of my bag as I was looking for a crochet hook to fix a dropped stitch. And to make it even worse…that one needle didn’t even make it back from Vegas! I lost it somewhere in our hotel suite (we stayed at the Venetian and it was absolutely beautiful). I found one pair left on Amazon and ordered them and they sent me size 3’s by mistake! Clearly I’m not meant to have these. On the bright side it gave me an excuse to go to Sin City Knit Shop to buy double points and of course some yarn. I grabbed some of the Katia cotton and merino blend yarn I’ve wanted to try and some of their local yarn in a fun colorway. Perhaps these will become a fun brioche project? The shop was nice and had tons of people knitting in there! I love visiting warm and welcoming spots. I’d definitely say give them a visit if you’re in Vegas. Poor you! I hear that Chiogoo has a new interchangable set with 2 and 3 inch tips and cables of various lengths. I think they are called shorties. Your Yarn is beautiful. I may have to check the Chiagoos out! I bought a set of these for Xmas but haven’t tried them yet. They are in the cutest little package. Sorry about your needle issue DWJ. Oh, no! Losing tools is the worst. So sorry for you… And also for us, not getting to read your review. I love my inherited needles for sentimental reasons, but am discovering that some of the new inventions really are easier on the hands and even make a better finished product. Glad the rest of the trip was fun! I like these a lot for sleeves so I was sad to lose them. Plus they aren’t cheap! But it didn’t ruin my trip but in the future I’m definitely packing just dpns! I have been wondering if it’s okay to fly with knitting needles, and scissors, darning needles, & other knitting paraphernalia? As I’m flying to N.C. in a couple weeks and have some wips to work on. (it’s a 7 hour flight!!) Does TSA have a problem with these items? TSA allows knitting needles (see their site here: https://www.tsa.gov/travel/security-screening/whatcanibring/items/knitting-needles) and every once in a while I get screened because they can’t tell what they are in the bag. I typically take a set of nail clippers with me instead of scissors. 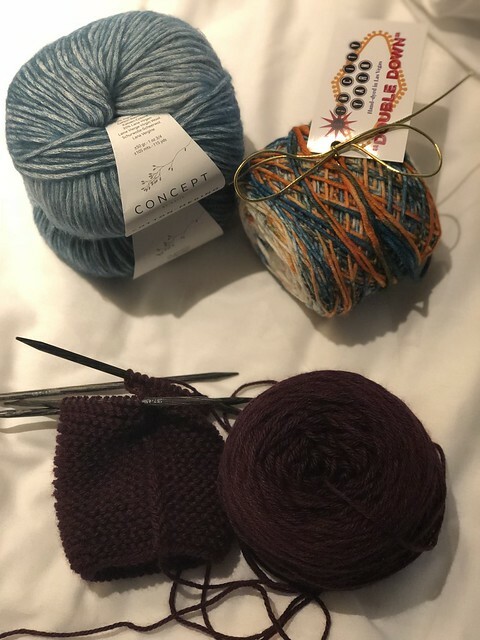 Before I visit any new town I check out the yarn shop situation and any along the way! So sorry you lost some tools-it’s annoying besides the money loss! Sorry for the loss of your needles! Am pretty sure that Yarning for You, San Marcos, CA has stock on these. I used to live in Vegas and I’m so happy to hear Sin City Knit Shop is thriving!